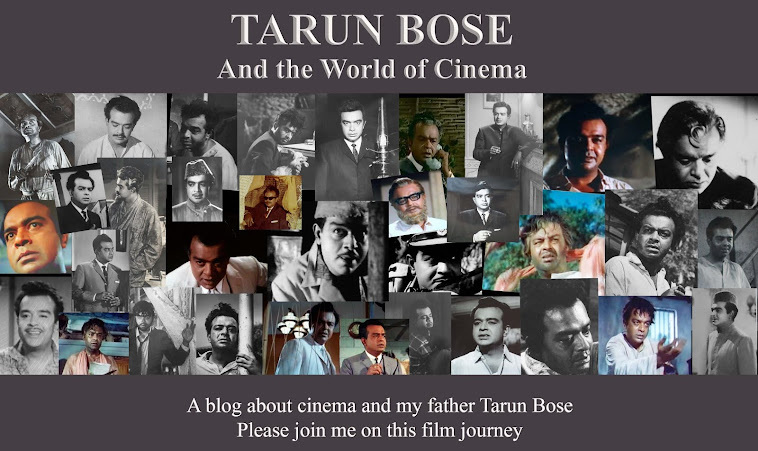 Tarun Bose and the World of Cinema: Forgotten Melodies (Part 1) – My Favourite Dance Sequences From My Father’s Films. Forgotten Melodies (Part 1) – My Favourite Dance Sequences From My Father’s Films. Way back in the old days of black-white cinema and even during the early days of colour films, the directors were truly the captain of their ships. They took an active interest in every aspect of film-making, naturally therefore no song or dance sequence or fight sequence was filmed in the absence of the director. During the eighties things began to change. I learnt that the directors handed over the reins to the dance director for the song and dance sequences and the action directors for the fight sequence. I was surprised to learn that the directors did not bother to be present on the sets or the location. Not surprisingly therefore, while the song and dance sequences blended with the film’s narrative in the past, later on and even today, the songs appear from nowhere and look more like music videos. The dance sequences remind me of aerobic exercises. How I miss the dance sequences of my childhood. Back in my childhood I heard names like Lachhu Maharaj, Gopi Krishna, Sachin Shankar, all of whom were legends to whom filmmakers turned when they wanted a choreographer. While most of the choreographers were accomplished and respected classical dancers, there was Sachin Shankar a cousin of sitar maestro Pt. Ravi Shankar who had trained under the legendary Uday Shankar (Ravi Shankar’s elder brother). Shankar’s area of expertise was dance ballets and dance dramas. His shows ran to packed houses. Those days nobody danced to film songs on stage, they either performed classical dance, or ballets. I remember reading that Vyjantimala was furious when, while performing Bharat Natyam, the audience began hounding her to perform one of her dance numbers from her films. We had the opportunity of watching dance sequences in films that were based on classical dance. The actresses were fully clothed but the sensuality was apparent in the adaas, hand gestures and facial expressions, of course the icing on the cake was the lyrics which was sheer poetry . The dance sequences those day were not obscene, the camera was not used by the director to titillate the viewer. I also miss the strains of the sitar, sarangi, sarod and the rhythmic beat of the tabla. What we hear these days is the synthetic version, I call it sythentic because all these sounds emanate from the sythesizer. I, therefore, decided to post some of my favourite dance sequences from my father's films. The dance sequences are based on classical as well as folk and yes I have also included some western dance numbers. Choreographers- Sohanlal, Satyanarayan, Sachin Shankar. I have selected two songs from Madhumati. Both have the folk element. Music Director Salil Chowdhury was very influenced by western classical music, but he was also very adept at composing tunes based on folk music. julmi sangh aankh ladi --- everything about this song is wonderful, Vyjantimala’s dance, the picturization, lyrics and of course Salil Chowdhury’s composition. chad gayo paapi bichua ----- well I am not going to repeat what I have mentioned above that is, once again Bimal Roy, Salil Chowdhury, Vyjantimala, Shailendra are superb. While I do not know which of the three choreographers choreographed julmi sangh, but chad gayo paapi has the unmistakable stamp of Sachin Shankar. If you watch shivji bihaane chale from Munimji you will see the similarity. This is one my of favourite films, actually not the film but my father’s performance was what I really liked in this film. This is one film where I saw him in a role I had never seen him before. I saw him enjoying a mujra, quite unusual for my father. All the songs in this film are lovely particularly the one’s sung by the film’s heroine Suraiya, but the song I have featured here is insaaf tera dekha ae saaqi ae maikhana. I did not find this song on You Tube but fortunately the film has been uploaded on You Tube, so I have been able to tube chop the song. Along with the song I have also included a small portion of the scene preceding the song just to show how young and roguish my father looked with that curl of hair falling on his forehead. The music composition by Ghulam Mohammed is beautiful and so is the rendition of the song by Suman Kalyanpur. insaaf tera dekha ae saaqi ae maikhana. One of the two songs that I have selected from this fim is a lavani –the folk dance of Maharastra and the other is based on classical dance. Frankly I was surprised to find Harman Benjamin’s name in the credits, because I have always associated him with western dance and not Indian classical or folk. It is quite possible the dance directors who were assisting him were the ones who had the required training. In fact you see a male dancer in the song jhanan jhana baje who is supposed to be Tanuja's dance teacher in the film, it is quite likely he also did the dance direction. naache man mora magan--- this is a treat for all lovers of classical music and undoubtedly the dance director I am sure was none other than Kathak maestro Gopi Krishna. Once again my favourites her are a folk number and classical number. raat bhi hai kuch bheegi bheegi has all the adaas and expressions so typical of Kathak. This song was definitely choreographed by Lachhu Maharaj, you can see his typical style in this dance. moko peehar mein mat chhed is a song I loved right from my childhood, though I could not make out what the singer was singing. Choreographers - Surya Kumar, Harman, Roshan Kumari. aaj ayere baanke more sainya- I have some wonderful memories of this song. I remember my father taking us to the sets, it was a lavish set and I still have a faint memory of Saira Banu and Shashikala dancing as Premnath and Dev Anand watch. Saira Banu the dancer was a revelation for me in this song. I knew that Asha Parekh, Waheeda Rehman and Vyjantimala were trained dancers but I had no clue about Saira Banu's Indian dancing skills. kala nahi paaye jiya--Vyjantimala is one of my favourite dancers along with Asha Parekh, Waheeda Rehman and Helen, therefore there was no way I was not going to include this song. koi matwala aaya mere dware-Once again my favourite dancer Asha Parekh , I just love to watch this song over and over again. Now for some western numbers. Helen obviously tops the list. Choreographers- Surya Kumar, P.L.Raj, Satyanarayan and Herman. iss duniya mein jeena ho- Although this is not stictly a dance sequence, but it is one of my favourite songs and it is Helen. Although she is prancing around you can see the rhythm in her movements and yes she is dancing as well isn't she? hume kale hain to kya huaa- It is a treat to watch both Helen and Mehmood, Mehmood was the son of Mumtaz Ali who was acclaimed as a dancer and choreographer during his days at Bombay Talkies. You can see that Mehmood too had rhythm in his body. This song has a mix of both Indian and western dance. jaan pehchaan ho-- I think it would be sacrilegious not to include this song while talking about Gumnaam. I always felt that Herman Benjamin was wired to the music, his body appears to be completely in sync with the music. Choreographers- P.L.Raj, Satyanarayan, Kiran kumar. ek nazar chahoon -This song was a hit and Helen is well Helen. I have spelt Herman as Harman as well because that was what I saw on the credit titles, his name was spelt both ways. I mentioned Sachin Shankar above, he is the lead dancer playing shivji in the song shivji bihane chale. Zaheeda’s grandfather in Anokhi Raat. His daughter Surekha Pandit played my father’s wife in Anupama. While researching for this post I came across this interesting information on Atul's Bollywood Song a Day about the folk song moko peehar mein mat ched, click here to know more about this song. Choreographer P.L.Raj is the father of musician Leslie Lewis of Colonial Cousins fame. Finally before I end this post a song which is not a favourite, but all the same I have included it here. It is from Umeed. My father was absolutely uncomfortable doing this song. My mother told me that my father pleaded with the film’s director Nitin Bose to drop the song but it was no use, he was compelled to do it. The problem with my father was that he liked to play the villain but definitely not the lecherous one. What I find funny is that my father had to go through with it for a film which did not find any takers. No distributor was willing to put in his money on a black and white film when all films were being made in colour. Actually Umeed was under production for a long time. The film finally released long after my father passed away in a single matinee show at Metro. I will continue with Forgotten Melodies in my next post. This time I will select those songs which strike a chord in my heart as well as those songs which I just like because of the melody and the lyrics. Labels: Bikhre Moti, Chan Aur Suraj, Choti si Mulaqat, Gumnaam, Love in Tokyo, Madhumati, Meri Surat Teri Aankhen, Mujhe Jeene Do, Munimji, Pyar Mohabbat, Shama, Umeed. Shilpi, I agree completely with you about the way songs were woven into the film's narrative, especially by directors such as Bimal Roy, Guru Dutt, Raj Kapoor, and Vijay Anand. And I share your opinion about dances - the grace, the adas, have completely gone out of them, what with the hundreds of extras and as you so aptly put it, 'aerobic exercises'. Interesting selections. I like this dance song a lot from Apradhi Kaun. Quite an interesting subject. Also, it has been treated as passionately and as intimately as other subjects, which appear to have more direct correlation with the persona of Shri Tarun Bose and characters on the screen. excellent.loved reading it.I didn't know that surekha Pandit was the daughter of badri prasad. Glad to know u loved reading it.